Let’s take a look at the state of Legacy over the recent weeks to see if there is opportunity included in decks that have done well recently. 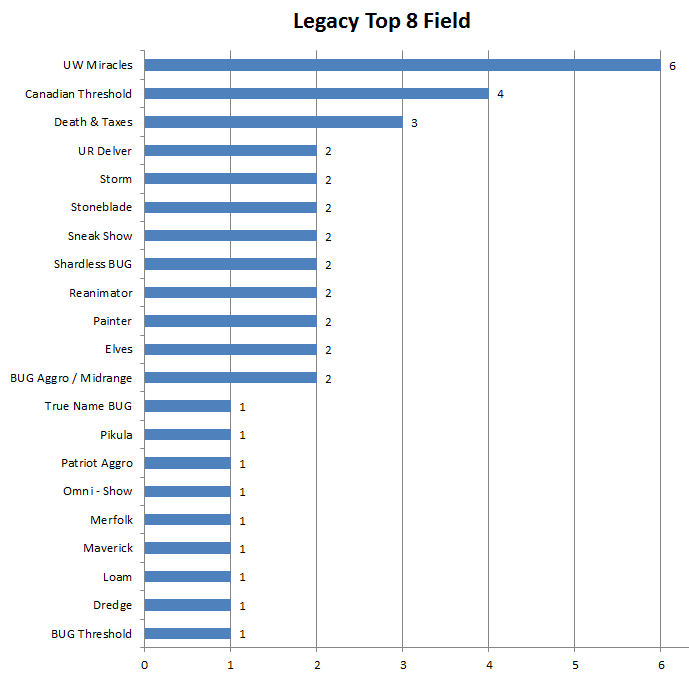 UW Miracles is the most popular control deck in Legacy over the last month and it is putting up the most Top 8 results to back up this popularity. It is doing 33% better than Canadian Threshold, 50% better than Death and Taxes, and 67% to 83% better than the rest of the field. One card that sticks out to me right away is Counterbalance, the focal point of the deck. Outside of Dark Depths and Zur the Enchanter, Counterbalance is the third most expensive card from Coldsnap sitting at around $9 retail. Sensei’s Divining Top, the other piece to the lockdown, is priced around $28 retail. 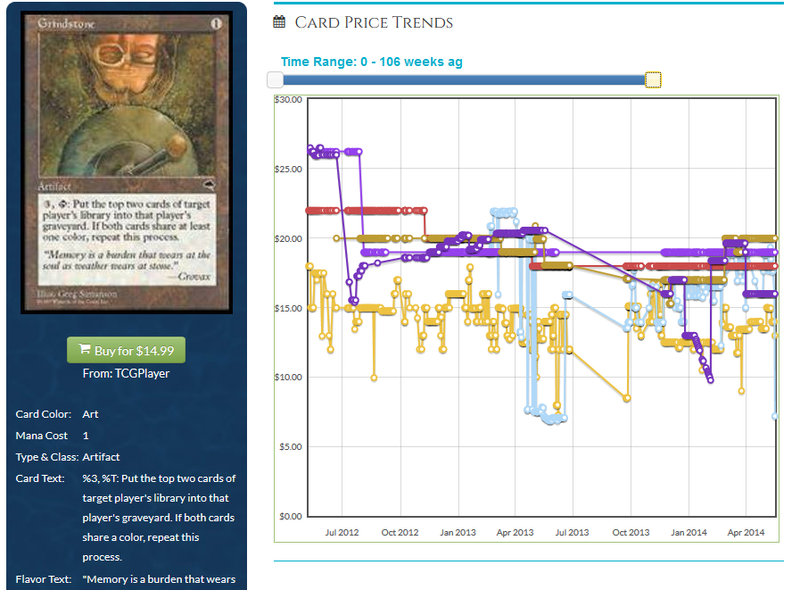 How can Counterbalance be a $9 card when Top is more than triple its price? Clearly, Counterbalance only has demand in competitive eternal formats but what if one day Wizards decides to unban Top from Modern? Counterbalance could possibly be a real force in Modern in addition to the Legacy play it sees. Even outside this potential unbanning (which is really just a pipe dream at this point) I feel that it being a key piece to the deck means that we should be keeping a close eye on the card. The next cards that stick out to me are the namesake of the deck, Terminus and Entreat the Angels. Terminus probably has the most growth potential as it clearly is a good sweeper in casual formats like Commander in addition to being included in Miracles lists as three or four copies. Non-foils are currently priced at $4 which I believe is lower than the demand it is seeing. Foils are $25 and even though this is a high entry point I also think foils are a good pick up right now. Terminus has a good chance of seeing another price increase within the next year. Entreat the Angels has already jumped up in price earlier this year, doubling from around $5.50 retail to its current price of $11 retail. This makes me less hesitant to go after it like I would Terminus, yet the potential for another price increase isn’t out of the question as Avacyn Restored ages like a fine wine. While this card is not as awesome as Terminus in casual formats and is included in fewer copies than Terminus in UW Miracles (mostly two copies per deck is the norm), I still would keep a close watch on Entreat the Angels for any further movement. 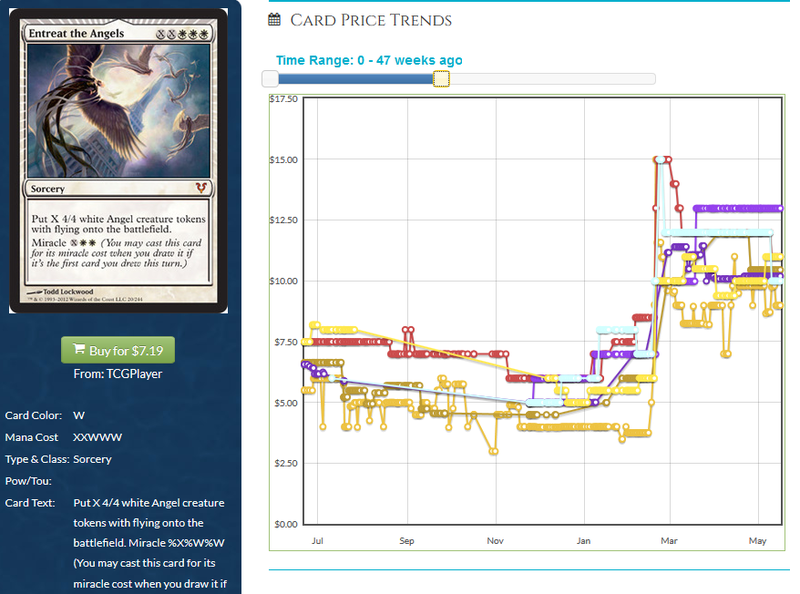 Casuals do love angels, so maybe I am even underestimating the casual appeal of the card. Foils are around $40 which aren’t moving downward any time soon – if you want your foil copies get them before they go up even more. Jace, the Mind Sculptor – The deck usually includes three copies and this is the best planeswalker ever printed. The FTV hype has died down a bit, and I remember before FTV:20 was released he was around $125 retail. I would expect non-foil WWK copies to go up again to this price and eventually surpass it. 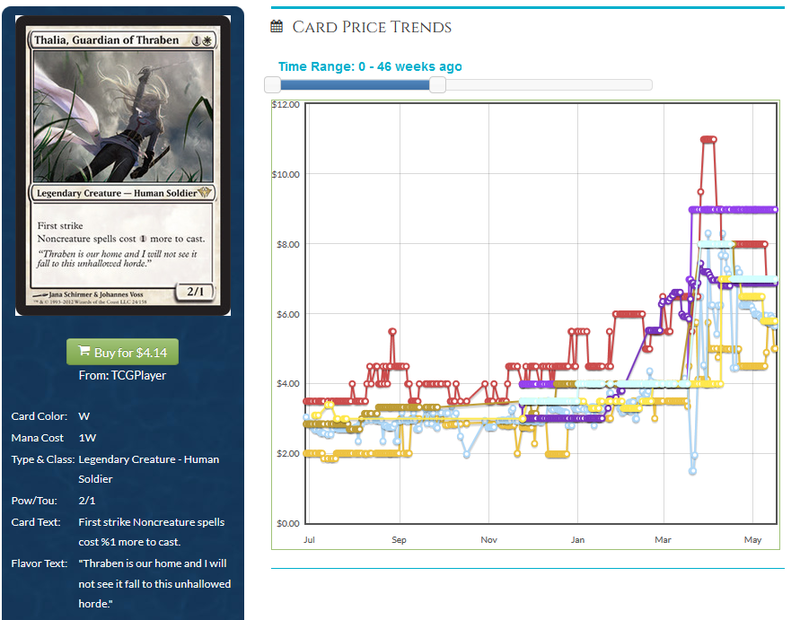 Flooded Strand – Until a reprint, this fetchland could trend up and match Polluted Delta’s price of around $120 retail. It is currently sitting at $95 retail. Not a lot of growth and very risky considering the imminent reprint of fetchlands to make Modern more accessible, however for a short term flip it could be possible to make a profit if Miracles keeps seeing a ton of success. Vendilion Clique – Along with its popularity in Modern, Clique has a good chance of going up in price during the summer. It may already be too late yet if you haven’t I would suggest picking up your copies of Clique if you want to play UW Miracles. Modern will only continue to drive the demand for this card moving forward. Rest in Peace – Both foils and non-foils of this card will continue to be in demand as time goes on. Though it is a very reprintable effect, I can still see this going up in time until that reprint happens. Pick up foils if you want a card that will keep its value over many years. Wear // Tear Foils – These are hovering around $9 right now. Fuse cards are extremely hard to reprint, so getting in on foils of these will be especially good for your portfolio a year or two down the line. Between Modern and Legacy this is a very widely played sideboard card so I foresee it continuing to be in demand. Even non-foils of this card under $1 are a good pickup in my opinion. A Legacy classic. Canadian Threshold has been around in some form or another in Legacy ever since Nimble Mongoose was printed and Threshold became a mechanic. It has gone through various changes over the years however the backbone of the deck is still the same – an aggro tempo deck that utilizes cheap spells to manipulate the library and out-tempo the opponent. Not a lot of opportunity there considering Bolt and Ponder both have several printings in foil. Delver of Secrets foils, however, have room to grow. $16 is rather cheap compared to the rest of the foils in the deck and I can only see them getting more valuable as time goes on. Being a double faced card means that it will be harder to reprint than other cards which makes it even more awesome to pick up your foil Delvers sooner rather than later. Other than foils the deck doesn’t really have anything that stands out to me. The rest of the deck’s components will continue to be affected by the popularity of the Legacy. Legacy has been very popular over the past several years, and I foresee it continuing to be popular for quite a while yet. Death and Taxes has been talked about quite a bit before but there is still opportunity. It is the second most popular aggro deck in Legacy behind UR Delver and has already had a substantial impact on prices in the Legacy format. Cards like Rishadan Port, Karakas, Wasteland, and Stoneforge Mystic have all seen incredible price increases due to the popularity of this deck (Wasteland and Stoneforge also being bolstered by their general utility in Legacy). The card that sticks out the most to me in this deck is Phyrexian Revoker. Its currently around $3.50 retail and foils are going for about $22. For now, I don’t think there is much opportunity with foil copies though regular copies will most likely see a bump in price soon. It is an important component to the deck that you can cast off of colorless lands and allows the D&T player to shut down many important activated abilities in the format. Outside of Revoker, I see that Spirit of the Labyrinth has become an important component to the deck at least at the Bazaar of Moxen tournament where two D&T decks placed in the Top 8 running copies. Regular copies aren’t moving in price for a long time, since she is in Standard and not that great in that format, but foils are currently sitting at $15 which is pretty appetizing to me. 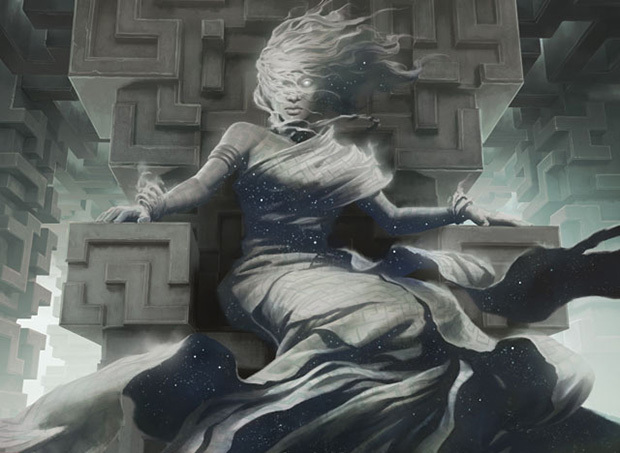 At Bazaar of Moxen, one D&T player had four Spirits in their deck – a clear sign that it could become a staple in Legacy’s future. Eventide Flickerwisp foils are $10 each, which is a pretty decent price for a card that is played as usually three copies in the deck. Leonin Arbiter made a showing as a playset in one D&T player’s main deck. In addition to his popularity in Modern Hatebears, for $3 nonfoil and $13 foil it could be a good pick up either way. There were three Serra Avengers in the winning deck at SCG: Cincinnati and at $1.30 retail for M13 copies and only $13 for Time Spiral foils this could also be a juicy pickup. Aether Vial – Since this is already at $25 non-foil and $40 foil, I don’t think there is much room for growth. It does see marginal Modern play in about 7% of the decks yet I’m not sure if this is enough to make it spike during the Summer PTQ season. Picking these up in trade is always good but I would be hesitant to go too deep on them. Thalia, Guardian of Thraben – I still think Thalia will continue to go up in the long term. She has already doubled in price since January, though without a reprint this year I think she could go higher still. Don’t buy these in cash; I feel that similar to Aether Vial they are good trade targets. Foils are already at $40, which is rather high but I wouldn’t want to be that guy who wished he would have bought the foils one year from now at this time. In this section, I want to talk about outlier decks that you can see in the bar chart above that put two copies in the past month’s Top 8’s to see if there is potential for a card to see a substantial price increase. Painter – This deck put two people into the Top 8 of SCG: Knoxville. One version opted for Imperial Recruiter while the other opted for only Goblin Welder and Painter’s Servant and instead went for the Intuition package win. First off, Imperial Recruiter will have a hard time going up any more in price. The judge foil is already approaching $200 so unless you’re Rich Uncle Pennybags this “investment” is best avoided. Imperial Recruiter will continue to go up in price due to sheer collectability, especially the P3K version, but judge foils are mainly impacted by the popularity of Legacy. Only pick this up if you are seriously considering playing Painter. You won’t make too much money sitting on these for a year and there is the slight chance it could be reprinted in a supplemental product. On the other hand, Painter’s Servant, Goblin Welder, and Intuition could all go up in price suddenly over the next year. They are sitting at $12, $9, and $35 respectively at retail value. If the non-Imperial Recruiter version of Painter becomes popular due to its recent success than all three of these cards could see a substantial bump. However, I would caution that this is more a pet deck than a really popular deck at this point. It may be hard to offload the cards at the new price if there isn’t a surge in popularity of the deck. In addition to the card’s mentioned above, Grindstone could also take off if Painter rises in popularity. Its price history has fluctuated and it currently stands at $18. The demand of the card waxes and wanes with the popularity of Painter. With the resurgence of Painter, though, it could see the $25+ highs that it was at two years ago. One caution against this is that Grindstone is not on the reserved list, so it could be reprinted in a supplementary product at some point. However, Intuition is on the reserved list and is played in more decks. Shardless BUG – Shardless BUG has been talked about a lot, but I want to mention that the deck’s namesake Shardless Agent is sitting around $15 retail right now. That price could easily go up past $20 if the deck becomes more popular. Liliana of the Veil and Toxic Deluge should be watched for any price changes – I can see these going up more and more as time goes on as they are both great Legacy cards. Also, don’t forget about Deathrite Shaman and Abrupt Decay – the popularity of these two cards can’t be stated enough. Like Stoneforge Mystic, I feel that once Deathrite and Abrupt Decay rotate out of Standard and become harder to find their price will only continue to creep upwards. Elves – Elves is another deck where I expect cards in the deck to rise. Glimpse of Nature, Natural Order, Wirewood Symbiote, Heritage Druid, and Green Sun’s Zenith are all on an upward mobility path in regards to price. I’ve already talked about elves before so refer back to my other article to understand why I feel this way. I’ve harped plenty in this article on Legacy staples I’m focusing on – which ones are you focusing on and why? Are you looking to pick up foil or non-foil versions of cards? Let me know in the comments. People say that Legacy is dying. These prices seem to say otherwise. I’m looking forward to the exciting future that is in store for Legacy, both through cards released in Standard sets and supplementary products. Will Dack Fayden become the next big thing? I think the health of Legacy is tied to the rate at which MtG as a whole is acquiring new players. Some of the new people that get into Magic will have higher incomes and gravitate towards Legacy as a result. With the rise of BUG, I’m a fan of foil golgari charms. Whoa, gotta be a glitch there for $124 for Daze. Here’s eBay right now with one selling right now for “Buy It Now” for $3.25 + shipping. If you bid, you can probably get one for $80 or buy it now for about $100. $124 doesn’t seem too farfetched even though MTGPrice only has three stores listed for the average currently. Sensei’s divining top is 3x more expensive than counterbalance because it’s played in every edh deck.